It has been four weeks since the start of Spring term. The new as well as all the rest of the children have settled well in the nursery. 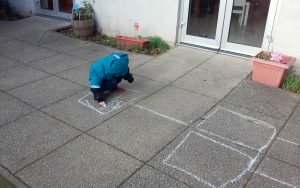 The cold winter season has not stopped the children from going outdoors and having fun every day. A big "Thank you!" 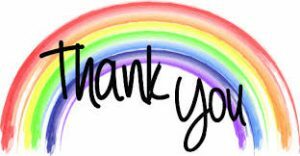 to Malorie for the colours of Rainbow cooking activity. 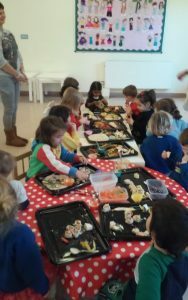 Last Friday, the 19th January, Ketzia's mum, Malorie run a cooking class on the theme of healthy eating. 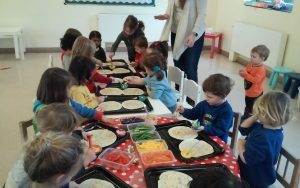 The children were introduced to fresh and colourful vegetables: sliced red peppers, red cabbage, yellow peppers, carrots and beans. They then spread some houmous on flatbread, added the vegetables and made rolls-ups. 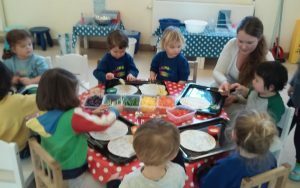 It was fantastic to see the children enjoying both preparing it and eating these colourful raw vegetables. The scent from the sliced vegetables added more benefit by refreshing the classroom for us all. For the children aged 4 plus, a trip to the local Queens Park Library is being organised, and it will be held on Thursday, 8th February 2018. For the younger group of children, we are liaising with the library to come around to our nursery to talk about their work and read the children a story. We will let you know when the date is confirmed.